Not long back I wrote about two local ladies who were training extremely hard in order to undertake the challenge of the London marathon. I am now writing this post from the centre of London, marathon complete, people packing the streets and the atmosphere is unbelievable. Everywhere you look there are signs of achievement, proud relatives, friends and exhausted runners. 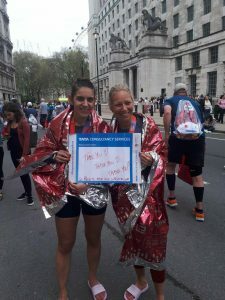 Emma Melrose and Shareen Geers raised more than £4000 for the charity, Make a Wish. What an accomplishment. Not only that, they showed true teamwork, amazing determination and by encouraging and supporting each other, crossed that finish line together. There were tears of joy all round. It just shows how teamwork and setting personal goals can help you to achieve anything you set your mind to. What an experience this has been, one I will never forget, thousands of people from all over the world getting together with the same aim in mind. I’ve made new friends and met some inspiring people – and that’s what makes the world go round. Marathon running is not an activity that I would personally undertake, so don’t think for a moment that I am going to take up distance running any day soon. But leading the field as a course leader on a motorbike is something that I wouldn’t turn down. Surround yourself with the right people and watch what can happen. ‘Alternative’ comedy was created by and for youngsters un-amused by ‘middle-aged’ TV comics delivering a string of one-liners. That many of these ‘middle-aged’ comics like Brian Conley, Bobby Davro and Shane Richie were barely into their 20s didn’t matter. They were considered ‘old school’ and soon ‘alternative’ comedy was all over the TV schedules. Whether this purge was good or bad is hard for a working comedian like me to judge. Funny is funny in my book*. If the 90s was the era of alternative comedy, 2018 has to be the year of alternative health advice. One week we’re told something we eat or drink is bad for us – the following week we’re advised it’s beneficial to our health! It confuses everyone, particularly my Uncle Cledwyn, who got the NHS advice about how many pieces of fruit he should eat every day muddled-up with the units of alcohol he’s allowed. So, every day he drinks five glasses of wine and eats two and half pineapples. Recently, while I was drinking my second cup of coffee of the day, I read an article in my paper that said three cups of coffee a day are good for us. So, I increased my daily coffee intake by one more cup. Last week, as I was drinking my third cup of coffee of the day I read an article in my paper that said that, in California, coffee shops will soon have to warn customers that coffee contains carcinogens. You’d probably have to drink several hundred cups of coffee a week before it caused you any problems, but I’m going to play it safe. Barman! Two large Merlots for Uncle Cledwyn and me! On Sunday, The new Selwyn Samuel Event Arena in Llanelli hosted the Welsh Factor National Final talent competition to a sell-out audience of more than 1000 people. Again, we witnessed young talent from the heart of Wales who had worked their way up through the heats, beating strong competition in order to share the final stage with some of the best new talent Wales has to offer. What an achievement – and an occasion that many who were there will remember for years to come. We were entertained by dancers, a choir, singer-songwriters, duos, trios and a magician. It would be fair to say that all 54 acts who made it through to this final heat were clear winners in my eyes. Over the years, I have witnessed the popularity and growth of this event and am yet to see a rival match its commitment to the showcasing and development of performing arts here in Wales. This is the platform for new talent to gain confidence and exposure, in a supportive and friendly environment. Welsh Factor was founded by the extremely hard-working Miss Anna Marie Thomas from Neath, and mentored by her dad Gareth Thomas, who has been involved in the entertainment industry for more than 50 years. This level of experience, together with a strong technical support team, enabled the talent on display to shine and entertain to the highest standard. Support your local performers! You know it makes sense. I’ve long suspected that so-called ‘inanimate objects’ are far from inanimate. Or they have a wicked sense of humour . . .
Just think about the number of times you’ve tripped over something in the house that wasn’t there the last time you looked. Conversely, how many times have you gone to pick something up that you definitely remember leaving on a table, only to find it isn’t there – and, then, you eventually find it in a different place in a different room? If you need more convincing, how often have you walked past a door handle while wearing old clothes without incident. But, the very first time you wear a brand new sweater or jacket you catch it on that same ‘innocent looking’ door handle, causing a tear in the material? Ah! Now you’re starting to believe me! But, the tables are turning – and not by themselves. A number of Welsh people are plotting against one of the biggest, longest and heaviest inanimate objects in the country. They’re so unhappy that it’s being re-named “The Prince Of Wales Bridge” they’re protesting and signing petitions. They may march on Westminster, brandishing pitchforks and lighted torches. It’s a day out. Bring sandwiches and a flask! Frankly, from where I’m sitting, up here on the fence, it’s unimportant what this bridge is named. It won’t answer when you speak to it or send you a Christmas card, because, being a metal structure built to convey vehicles from one side of the Severn to the other, it isn’t aware it has a name! When all the hoo-hah has died down, we’ll still call it the Second Severn Crossing as we always have. Mind you, “The Phil Evans Bridge” does have a nice ring to it. How do I start a petition? Don’t you just love nature and waking up on a sunny Sunday morning to lawnmower and petrol strimmers howling in the background? Yes, I bet you do. Having done a late night gig, Sunday morning is the only chance I get to have that extra hour of quality rest to recover from the demands of the weekend – but clearly others among us have their own ideas at this time of year. Don’t get me wrong, everyone is entitled to a well-kept back yard and a neatly-trimmed bush, but a few of my neighbours have taken this too far and have invested in those high powered, turbo-charged, petrol-driven hedge cutters and their enthusiasm for these new gadgets has meant that the whole street wakes up early to find out where the noise is coming from. I honestly thought that a Formula One racing team had relocated their practice sessions to Ammanford. But don’t worry about me, I’ve sorted it and will be ready for next weekend as I’ve invested in a large box of ear plugs. When I was a lad, our house always seemed to be full of grown-ups, our small living room bursting at the seams with friends, neighbours, strange relatives and relative strangers, the rent man, the Man From The Pru, the bailiffs . . . all of them larger than life and full of bonhomie. Or, in the case of Aunty Glad, full of Dubonnet. I’d sit under the dining table – which wasn’t easy as I was five feet tall at 12 – and ear wig the fascinating conversations buzzing back and forth around the room. Politics, religion, nuclear war, what should go on a scone (pronounced ‘skown’) first – the jam or the cream? No subject was deemed too controversial to discuss in front of me. As people tended to talk over each other, sometimes I didn’t hear clearly what was said. For example, I misheard a neighbour say, “Neither a borrower or a Brenda Lee”, and thought she was criticising the ’60s pop singer who these days we only hear on the radio in December, singing “Rockin’ Around The Christmas Tree’. Then there was Uncle Hugo, who’d explored many previously unexplored regions of the world that were no longer considered unexplored regions because he’d gone and spoiled things by exploring them. I was convinced I heard him say, “There are flies, damn flies and stick insects”, referring to one of his trips along the perilous upper reaches of the River Tawe. In fact, he’d said, “There are lies, damn lies and statistics”, and I thought about my late uncle (he’s not dead – just always late) recently when I read that by 2050 the number of people over 60 in the world will top two billion. Imagine the queue in the Post Office on pension day! And, with so many old people around me, I’ll have no chance of getting a full house at Bingo. Dear, oh dear. It’s all very worrying. I wonder if Aunt Glad drank all the Dubonnet? I was in a coffee shop recently, where I had an hour to spare to indulge in my favourite pastime. No, not that one! How dare you! While sipping my skinny latte, I discreetly listened-in to conversations and observed people’s behaviour, a habit which has always been grist to a comedian’s mill. Not that I know any comedians who collect grist or live in a mill. But I remember reading that the late Jim Bowen lived in a converted railway station. He hired builders to knock down the station tea-room and shorten the platform and in a matter of weeks it had come to a halt. That’s a joke only regular train travellers and train spotters who can read words of more than one syllable may get. The coffee shop I was in was a branch of a well-known chain and around me people were tucking into chocolate biscuits, paninis, pannatone’s with real butter etc. Delicious – but not particularly healthy. Because the counter, decor, tables etc. were identical to every other branch of this chain, until two nurses walked in, I’d momentarily forgotten that it was inside a hospital. I was waiting for visiting hours to start so I could pop up to the ward to see an old friend who was in for a minor procedure. ‘Procedure’ sounds so much pleasanter than ‘operation’ doesn’t it? From my observations, I find it ironic that the NHS tell us to eat healthily so we’ll be less of a burden on them in later years, yet they’ve allowed this coffee shop chain to open branches in hospitals all over the country. While the food they serve is always delicious and of top quality, wouldn’t it be better for hospitals to open cafes that serve healthy salads, fresh fruit and meals with low salt content rather than cheese and ham toasties, chocolate chip muffins and sugary hot chocolate drinks? The chip shop closes in five minutes . . . Plenty of chocolate, but are we missing something? On Easter Sunday, I was sprawled in front of the telly . . . eating my chocolate egg . . . when suddenly the manager of Curry’s/PC World came over and yelled at me to get out! This year, when I opened my chocolate egg and noticed that the packaging didn’t actually mention Easter – just ‘Chocolate Egg’, as if the manufacturers were embarrassed to include the word ‘Easter’ in case it upset potential buyers for whom Easter had no meaning. Confectioners make, advertise and sell chocolate eggs this time of year for a reason and not because it’s Pancake Day or National Pie Week. But because . . . it’s Easter! Children talk about ‘The Easter Bunny’; the holiday’s called ‘The Easter Weekend’; the Sunday is ‘Easter Sunday’; all the clues are there! If this trend continues, what might happen in the months leading up to December 25th? Will shops, supermarkets and department stores coyly hang up signs that just say “Happy…..!” or “Merry……!” leaving out the rather important word ‘Christmas’ so no-one is offended? Wait and see . . .
Talking of being offended, I certainly was when I read that at Easter, hospital A & E departments were over-run with people who’d made themselves ill by over-indulging. “People are coming into A&E with stomach aches caused by too many Easter eggs and a big Sunday dinner. You’ll feel better after a rest at home and drinking plenty of water”. I’ve heard it all now….